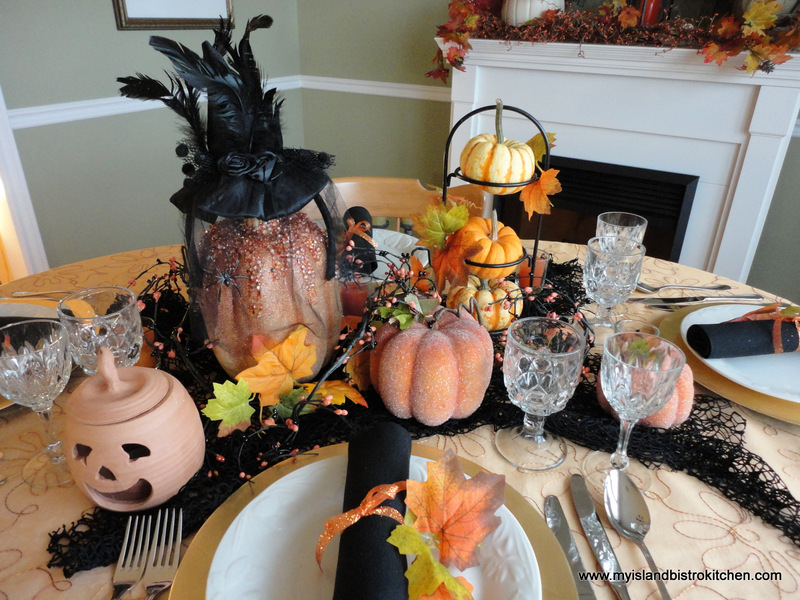 On this Halloween weekend, I am sharing my seasonal tablescape that has a distinctly pumpkin theme. I have chosen to use some good quality artificial decorations mixed in with some traditional ones that nature has provided. In keeping with the mood of the season, I have kept the lighting low and moody to give a golden glow to the dining room. I have a little collection of fall and Halloween decorations and, wherever possible, I try to work with I have as opposed to going out and buying more. I have had the terracotta pumpkin below for years. 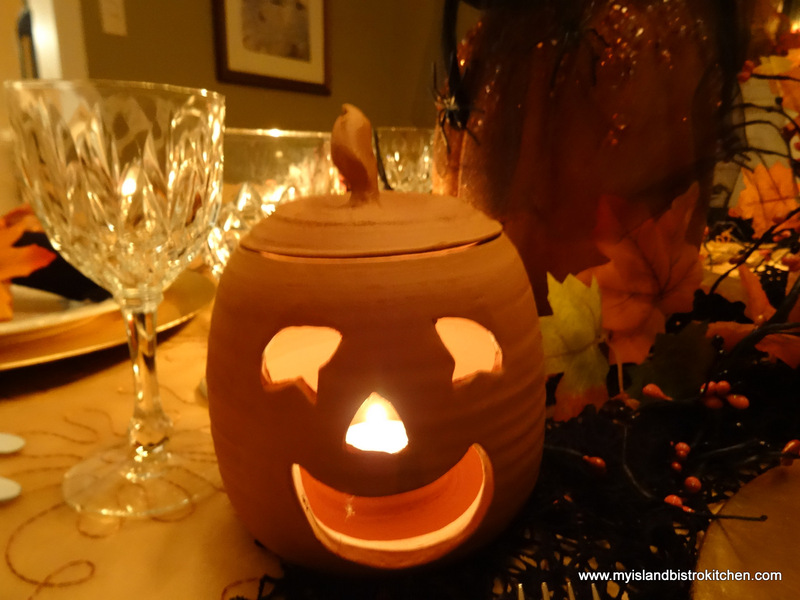 It’s so much easier to get a Jack-o-Lantern this way than the mess of carving a real one!!! 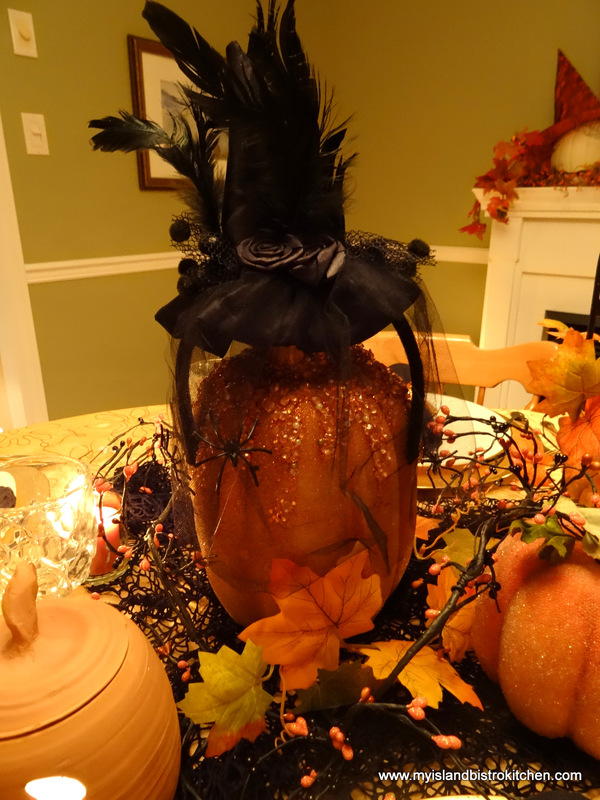 A glitzy pumpkin gets gussied up with a witch’s hat from the local dollar store. The headband/hat was a previous costume accessory. 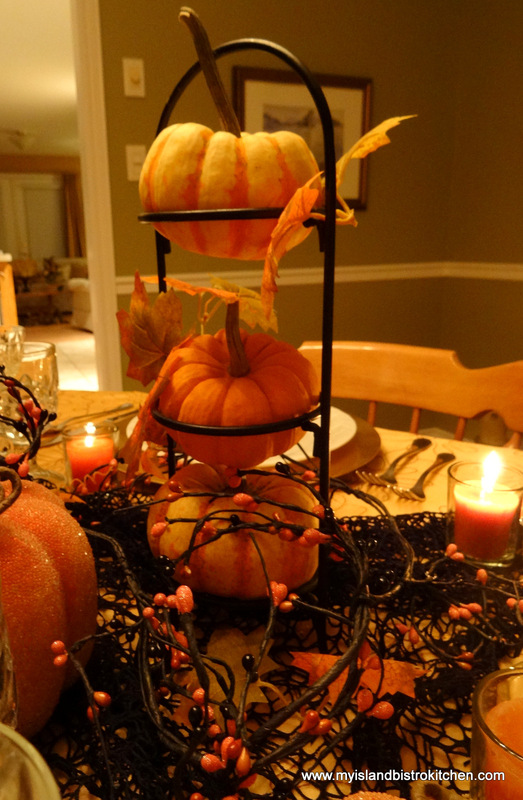 I found the little 3-tier server below at a local thrift store and it forms a nice tower for three mini pumpkins. It will also serve other purposes throughout the year. When I am creating a tablescape like this, I try to vary the heights of the components as it adds interest and appeal to the eye. 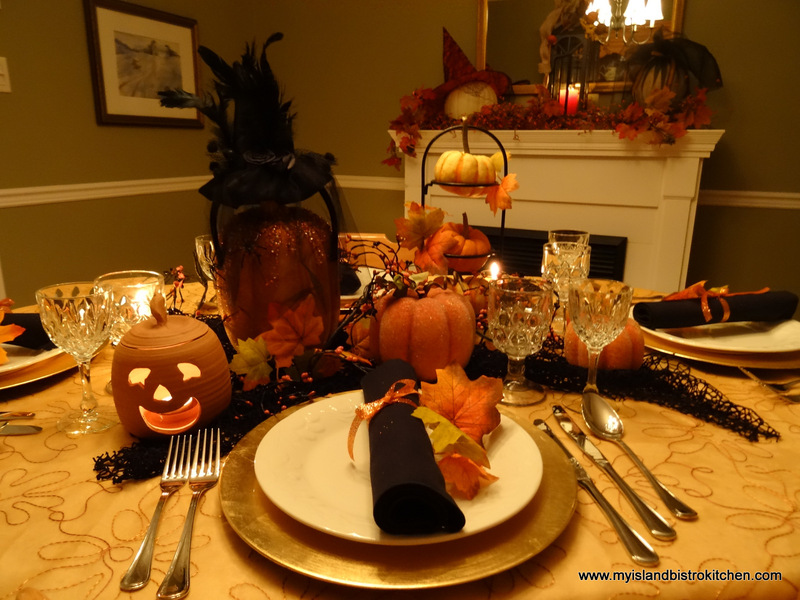 The color theme for the tablescape is orange, gold, ivory, and black. 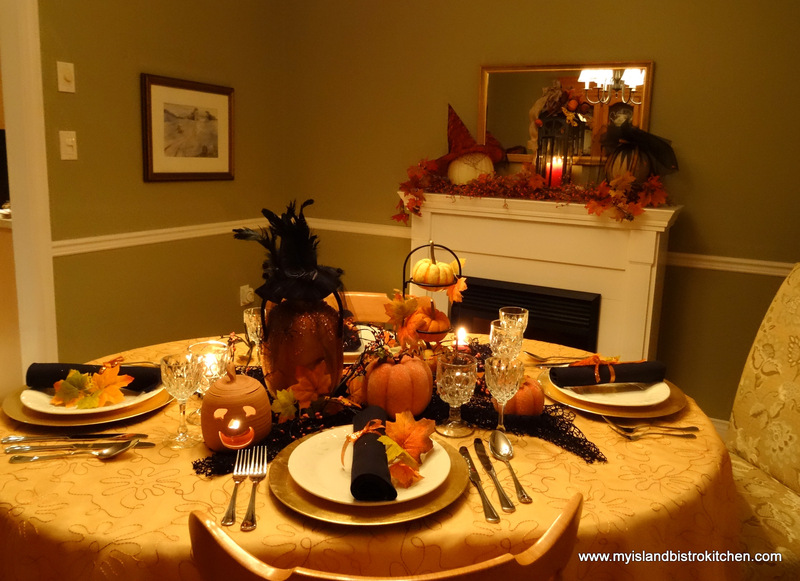 A piece of sheer orange curtain fabric over an ivory tablecloth makes an economical table covering without overtly screaming Halloween or competing with the focal point of the tablescape. A piece of black net fabric forms the base for the centerpiece display. 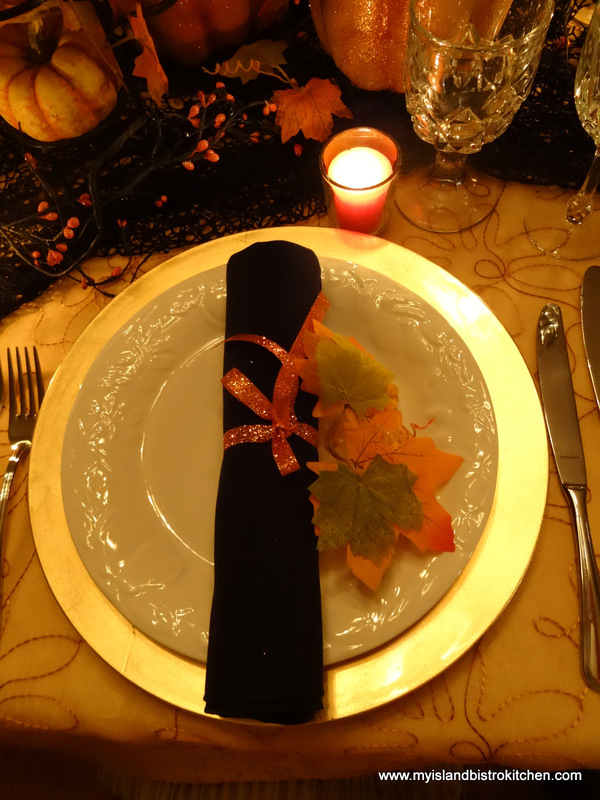 The gold charger plates frame the white tableware, a good backdrop for the black napkins which are simply rolled and tied with glittery orange ribbon and accessorized with some colorful leaves. 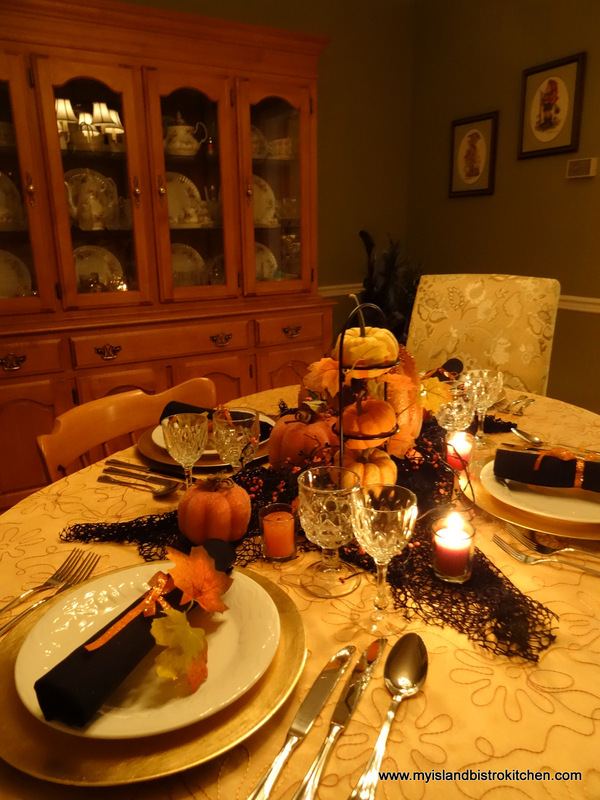 Little orange votives tucked in through the tablescape add some extra drama to the scene. 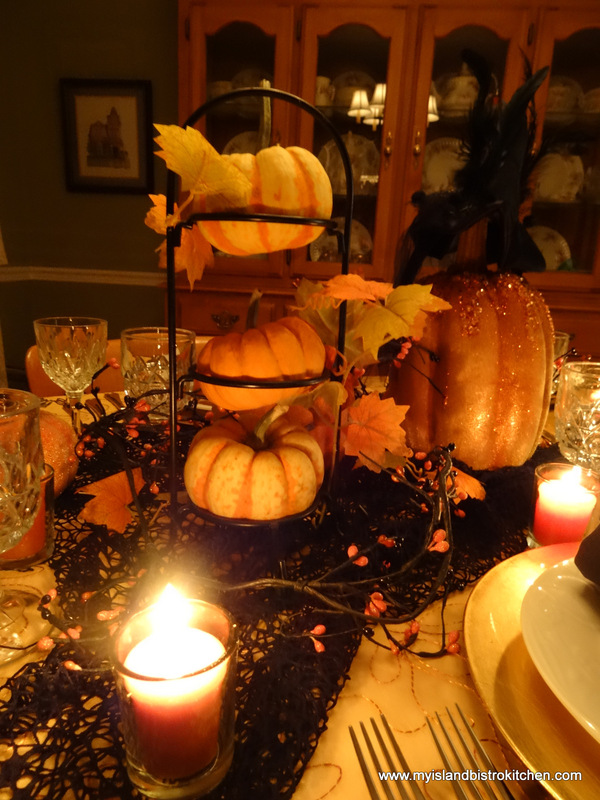 A number of years ago, I was able to get some good quality garlands of orange and black berries so they have been casually threaded in through the components of the centerpiece. The garlands are wired, making them easy to mold into areas needing some filler. 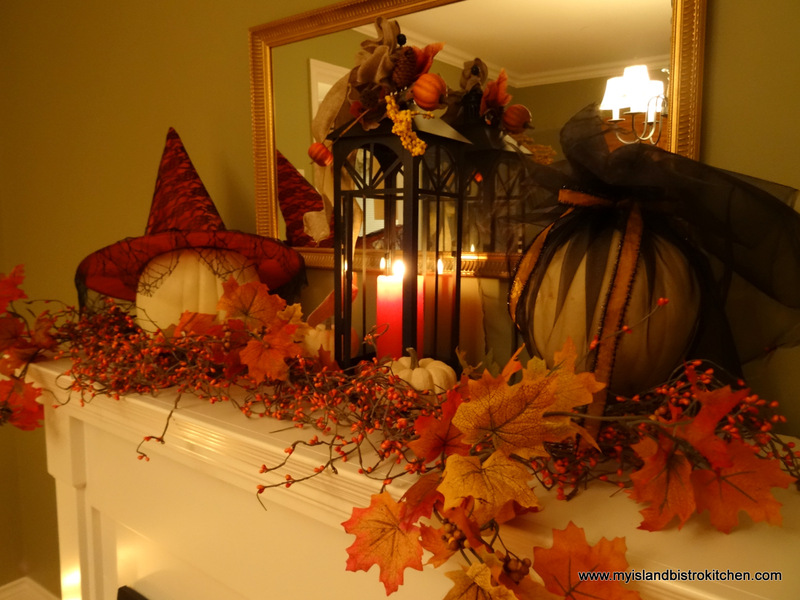 My fireplace mantle is decorated to compliment the table. 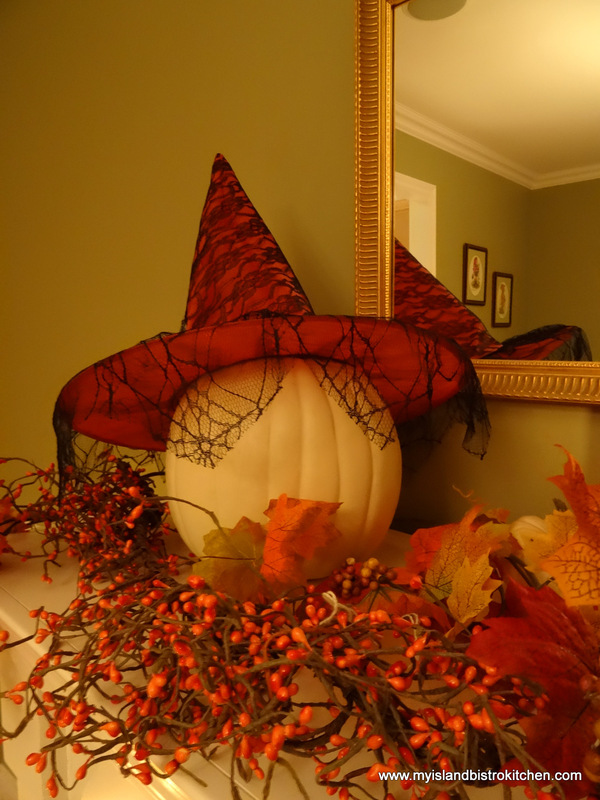 Framed behind garlands of orange berries and colored leaves, a white pumpkin dons a fancy witch’s hat. 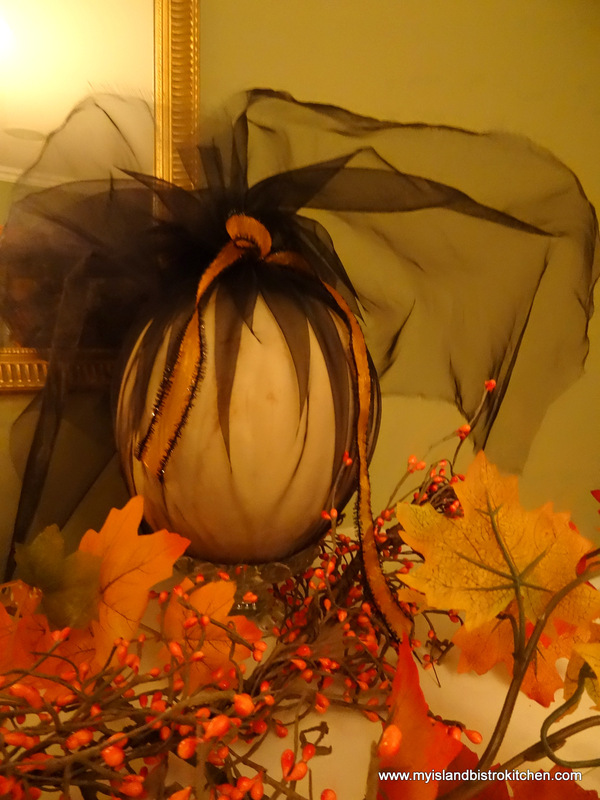 The white pumpkin below is simply wrapped and tied in black organza, giving it a dramatic look by the simple folds in the fabric. 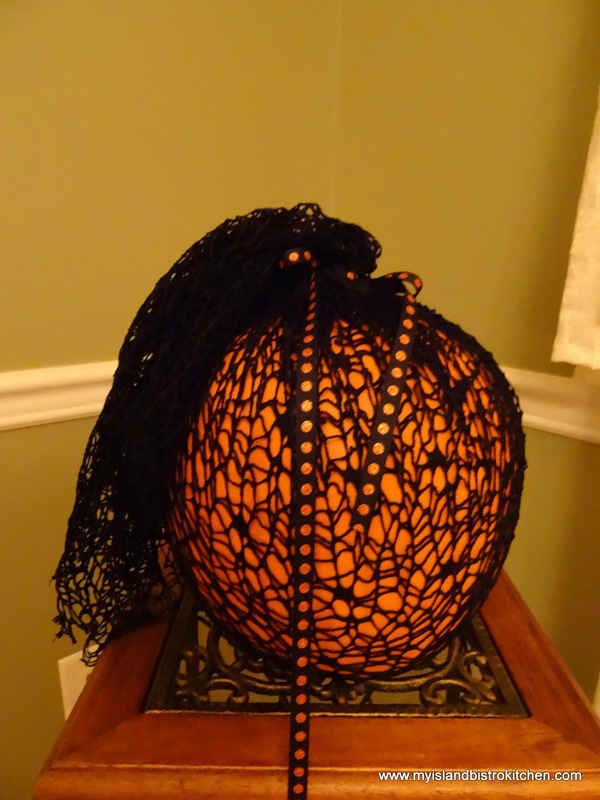 And, the orange pumpkin below is dressed in black spider web lace! Not nearly so dramatic but still colorful, nonetheless. I hope you have enjoyed a glimpse into my Halloween festivities.